Ladies and gentlemen, halftime is over. I hope you enjoyed your Fourth of July respite, because now it’s time to get back on the field and start playing the second half of 2017 in the markets. Before we attempt to determine where this market is going for the rest of the year, it’s probably a good idea to look back and see where we’ve been. That’s certainly the philosophy of one of my favorite Founding Fathers, Patrick Henry, who once famously said, “I know of no way of judging the future but by the past.” I agree with this, both when it comes to life at large… and when it comes to markets. With that notion in mind, we need to ask ourselves where the big winners were in the first half, and also where the big losers were. Doing so will allow us to take the pulse of this current market… and that’s the first step to determining where this market is likely headed going forward. A recent piece at MarketWatch, “The 10 best-performing ETFs so far in 2017 — and the 10 biggest losers,” made my research efforts relatively easy, as the piece provided that first-half exchange-traded fund (ETF) scorecard for us. The data here shows that if you bet against volatility, bet on technology, emerging markets, China, Poland and India, you are doing quite well. Subscribers to my Successful ETF Investing advisory service are currently enjoying gains in technology and emerging market ETFs. And, in the first half of the year, we banked a 39% win in India via the VanEck Vectors India Small-Cap Index ETF (SCIF). This is the power of the trend-following strategy at the heart of my service, and it’s worked exceedingly well in the first half. It also has worked to allow us to avoid the big losers in the first half. Not surprisingly, a bet in favor of volatility was a big loser. Then there was energy, led by natural gas, which saw its price collapse in the first half. So, there you have it, a list of the best and worst ETFs so far in 2017. Next week, we’ll take a look at some key events, along with some key dates, that could shape this market’s character in the second half of 2017… and quite possibly well beyond. I’ll be there moderating a debate between two of the most colorful investors in the business, Peter Schiff and Jim Rogers. I’ll also be participating in a panel discussion titled, “Can You Beat the Market?” If you’re at Freedom Fest, be sure to come up to me and introduce yourself. I love the face time with readers. To sign up, go to www.freedomfest.com, or call 1-855-850-3733, ext 202 and talk to Karen, Jennifer, Heather or Amy. You won’t regret it. Over the past several weeks, we’ve presented our three-part series on ETFs & the Music of the Markets. Here’s a compilation of all three parts, as many readers have asked me to put them all together in one place. Hey, you asked, and we listened. What do exchange-traded funds (ETFs), music and the markets have in common? Well, aside from the fact that I happen to love them all, ETFs, music and the markets have a lot in common. Here’s a little analogy to help illustrate my point. Remember the 2004 biopic “Ray” starring Jamie Foxx in the lead role as Ray Charles? I suspect you may have seen it, and if you haven’t, I highly recommend it. Foxx won an Academy Award for his portrayal of the great singer, songwriter and pianist, and the film was a no-holds-barred look at Charles’ life. In preparing for the film, Ray Charles sat down with Jamie Foxx, who also is a classically trained pianist, to play the piano together and exchange musical vibes. Here’s how Foxx described the encounter in an interview with best-selling author and podcaster Tim Ferriss. Wow, that is life, indeed. You see, the proliferation of ETFs over the years also has put the “right notes” underneath our fingers. In fact, today we can literally get portfolio exposure to just about any segment of the market by tapping on the computer keyboard that’s right underneath our fingers. And while doing this right may be easier said than done, it can and is being done by all sorts of investors, worldwide. Of course, the key to becoming a good musician, and to knowing the right notes to play, takes a whole lot of deliberate practice, knowledge and cultivated skill. It’s the same way with investing. Part of our mission here in the Weekly ETF Report is to help you acquire the knowledge and the skill to be able to play the right notes in your portfolio. In the weeks and months to come, I will be showing you my techniques to help you identify the right notes when it comes to selecting winning ETFs for your portfolio. Many of these techniques are at the heart of the proven, trend-following investment plan that’s helped investors preserve and grow their capital for over four decades in my Successful ETF Investing advisory service. One of the beauties of exchange-traded funds (ETFs) is that they allow us to hear the “music of the markets” playing out in real time. This week, we’ll look at that music a bit, especially in light of today’s “dovish hike” by the Federal Reserve. Exclusive A 93.3% Chance for a Rally in the Month Ahead? Simple enough, right? Only, not so much. Fortunately, the proliferation of ETFs in recent years has made playing the right notes a lot easier. Today, we can literally get portfolio exposure to just about any segment of the market by tapping on the computer keyboard right underneath our fingers. Last week, I also told you that part of our mission here in the Weekly ETF Report is to help you acquire the knowledge and the skill to be able to play the right notes in your portfolio. Well, we just had what may have been the most important Federal Reserve Open Market Committee meeting (FOMC), as today’s Fed decision will likely set the playing field for stocks and bonds going forward. Before the meeting, the smart money was betting on (i.e. pricing in) what’s called a “dovish hike” by the central bank. This is a situation where the Fed would hike interest rates by 25 basis points, but also make the statement “dovish” enough that it doesn’t cause long-dated Treasury bond yields to rise… and that’s precisely what happened today. The Fed did hike rates 25 basis points, and bond yields did fall. 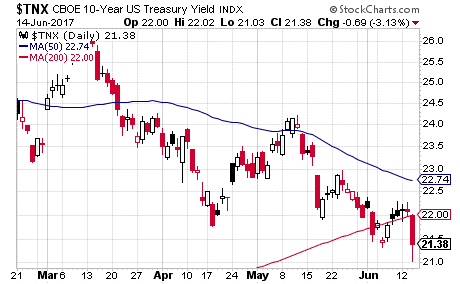 In fact, the benchmark 10-year Treasury yield fell sharply, down below 2.14%. This is important, because it’s a problem for stocks long term. 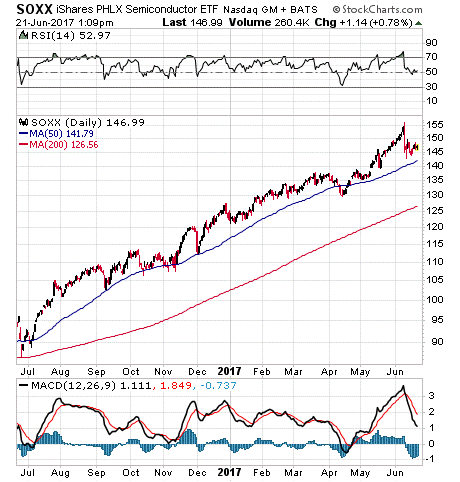 The reason why is that this market’s record-high rise has been fueled by the “reflation trade.” That means the market is expecting faster economic growth, and more inflation. Yet a stronger economy is not being reflected in bond yields, which should be rising. Also, the Fed admitted today that inflation is running below its 2% target rate. Yet the Fed still felt it could hike rates, and also begin the process of “normalizing” its balance sheet. “Normalizing” the balance sheet is Fed speak for “reducing Treasury holdings.” The Fed did announce its plans to do just that, even issuing an addendum to the FOMC statement outlining just how it would normalize that balance sheet. The bottom line here is that the Fed did pretty much as expected with its “dovish hike.” And we know that because stocks did rise, albeit slightly, with the Dow Jones Industrial Average hit an all-time closing high, which can be seen here in the chart of the SPDR Dow Jones Industrial Average ETF (DIA). Now that the Fed is out of the way, so to speak, it will be interesting to see how other market sectors react in the days ahead. Sectors such as the aforementioned Treasury bonds, gold, and various interest-rate sensitive sectors such as utilities, financials, defensive stocks and REITs will be the key segments to watch in the weeks to come. In Part III of our series, we’ll take a look at what’s happened in the wake of the Fed decision, and we’ll do so by listening to the music in the ETFs that play these various sector notes. So, stay “tuned” (pun intended). I love music, and I love exchange-traded funds (ETFs). Both allow us to hear the “music of the markets” playing out in real time. In our third and final installment of our series, ETFs & the Music of the Markets, we look at the tune being played in two sectors leading the market rally… semiconductor ETFs and large-cap Internet ETFs. Since the election, one of the key drivers of this market rally has been momentum. In the market version of Newton’s first law of motion, a market in motion to the upside tends to stay in motion… that is, until the market leadership falters. Given this market law of motion, it behooves us to listen to the music of the markets by listening to the action in top-performing market sector ETFs. Two of the best performers over the past eight months are semiconductor stocks and large-cap Internet stocks. The ETFs pegged to these respective spaces are the iShares PHLX Semiconductor (SOXX) and the First Trust Dow Jones Internet ETF (FDN). 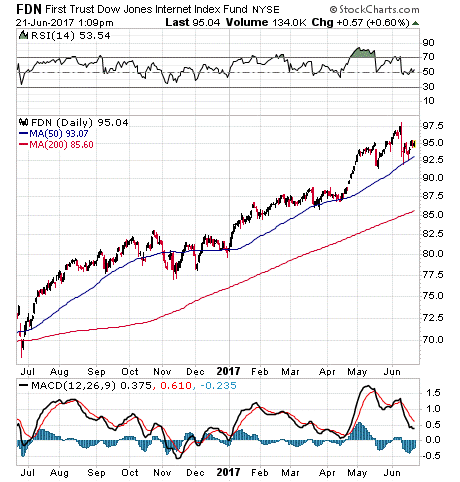 And while other sector leadership shifted from late-2016 and early 2017 (small caps to utilities and consumer staples), semiconductors have continued to ring out the bullish notes. As for large-cap internet stocks, it’s no surprise that nearly half of the 2017 S&P 500 rally can be attributed to just a few stocks: AAPL, AMZN, MSFT, FB and GOOGL. And, it’s not a coincidence that those stocks are heavily weighted in the super-cap Internet ETF FDN. Since then, both have resumed their upward trajectory, and both mostly recovered from that tough, one-day sell-off. (Note, the selling in these sectors ramped up again on Tuesday, June 27. 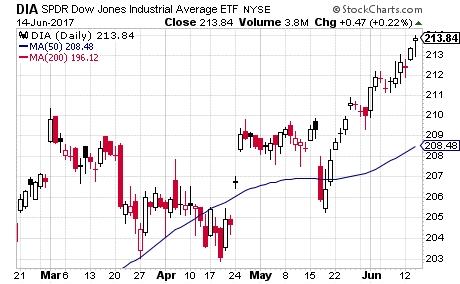 But the following, Wednesday, June 28, both sectors have come back strong). Yet it’s important to listen and watch the action in these two key sector ETFs, as another serious breakdown will imply a loss of momentum. If and when I hear it, you’ll be the first to hear it from me! I point this article out not just because it’s a very good read, and has very helpful hints on avoiding overconfidence. It does. I point the article out because I am quoted extensively in it, offering up my thoughts on getting past the all-too-human tendency to allow yourself to be overconfident.